But Seriously, How Do You Sleep at Night? You are here: Home / Life With Dogs / But Seriously, How Do You Sleep at Night? I sleep with Chester and Gretel. It’s my “comfort food”. You know, that meal you had as a kid that, when you eat it now, takes you to your happy place. ?When I was a kid, I slept with my cat Jack every night and sleeping with a small dog is similar. I recently bought a FitBit Force (which has recently been recalled due to “rashes”…which I have not had an issue with) that tracks my activity and sleep patterns. I didn’t need that thing to tell me that my sleep in constantly interrupted. 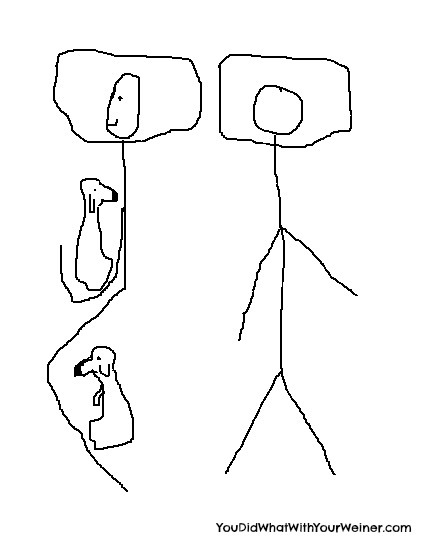 A while ago I wrote a post titled “How Do You Sleep at Night” with a few horrible drawings illustrating how restless Chester and Gretel are – switch positions all night – and how I move to accommodate them. I no longer have to get up at 5 am (been two years) to go to work but their doggy brains don’t know that. They STILL wake me up at 5 am every morning – or 430, or 4 or sometimes all 3 – to eat. Last night there was something going on with Gretel. Sadly, it is a more common occurrence than I like to think. Gretel and I went to bed at 11. Before I could doze off, Chester came in and wanted in bed. Hubby came in around 1230 to go to bed so we woke up for a minute. Gretel decided that she really had to pee at 130 am….and again at 330 am….so up and to the back door I went. Then both dogs started getting restless about 430 and finally insisted that I get up at 5 am. By then I was awake…so here I am writing this post. My blogger friend, Kimberly, at Keep the Tail Wagging just adopted two litttermate puppies. Although they don’t sleep in her bed, they cry several times a night and she has to get up to let them out. It is expected that they will grow out of this stage. Chester and Gretel are 4 and 11. One thing I like about small dogs is that they are like perpetual puppies. THIS is not what I had in mind though. They aren’t going to “grow out” of not sleeping through the night. I struggle with feeling tired throughout the day so I wanted to be more knowledgeable about how I am sleeping. The FitBit Force tracks the duration of my sleep and highlights the times I was restless or awake during that period. Folks, it hasn’t looked good. So the question is, how do I improve my sleep? Maybe the simple answer is stop letting Chester and Gretel sleep with me. That ain’t gonna happen though. First, THEY won’t let it happen. If I think my sleep in interrupted now, I would be in for a world of hurt if I tried to make them sleep in their crate. I’ve been down this road before. Chester howled and barked throughout the night and Gretel threw herself around in her plastic crate until it was busted open in the middle of the floor. Second, I would not be in said happy place. I would be lying if I said the thought didn’t cross my mind for a second but…drug them? I totally wouldn’t BUT it seemed like a reasonable option at 2 am when all I wanted was one solid night of sleep. Drug myself? I do sometimes take Melatonin to help me sleep more soundly. I feel like I do wake up less when the dogs are doing their midnight shuffle but it can leave me groggy in the morning. It appears the only solution is to just do nothing and like it. I am just wondering if you sleep with your dog and, if you had this issue, what helped you sleep through the night? Our 3 yr old doxie Snoop sleeps with us. We are lucky that he rarely gets up at night and sleeps through the night no problem. The main reasons he gets up are either for water or to go out. The latter happens rarely. We take him out at least 5 times a day and always make sure that he goes to pee before we go to bed. I’ll make sure he does the number 2 if he ate in the last few hours. He only asks to go out if we went to bed really early or forgot to let him out or if he is sick. There are times he gets into a 4am poop routine, iI try my best to make sure he eats and runs a lot the day after as that gets him to go before bedtime. We also have bowls of water for him in the room So he can help himself. I think the key is to get them into a bathroom/eating routine. We got it to a point that Snoop will poo and pee on command (within reason, if he ate or drank recently). P. S. Melatonin is not as good as claimed. I would recommend seeing a homeopath. I used to take Melatonin to sleep better and since I’ve stopped I have an amazing sleep schedule with the help of a homeopath. Just my two cents. The getting up at 430 am is to eat and not really about pottying. They are very food motivated and “strict” with me. I haven’t gotten up for work at 5 am for two years but they still insist. They eat twice a day – 5 pm and 5 am – and I have tried and tried to push both ahead at least an hour with no avail. It doesn’t matter if they ate at 9 pm (which only happens when I get home late because they whine and shake uncontrollably starting at 430 pm if I am home), they still want to get me up at 5 am to eat. I do suspect that if I “tired them out” all of us would sleep better. However, it takes around 2 hours a day of walking to even start to get to that point. As a graduate student that also works part-time, 2 hours a day is not going to happen anytime soon. Gives me something to strive for though. We have 5 small dogs (two cocker spaniels and three cavalier spaniels) ranging from 1 year to 18 years. All except the 18 year old sleep in the bed with us. It is the happiest feeling in the world to fall asleep with them piled on and around me, but I do understand what you are saying about being interrupted. I tell myself that falling asleep so quickly and soundly with them has its own rewards. I will be watching for responses to your blog for other solutions. Good luck! There is no way I can NOT feed Chester & Gretel at 5 pm but for a while I tried splitting their meal into 3 (it doesn’t matter that there was only a few tablespoons of food at each meal, they just want something in the dish) and giving them one portion very close to bedtime. My hope was that they would wait longer in the morning to wake me up. Nope! I really wish I could take them hiking every day, or afford doggie daycare, to tire them out. Our two doxies ages 1&3 sleep with us at night. They too wake me up 1-2 times a night to go potty. They however will not wake my husband if I am away traveling . I think they know that mommy is a sucker and will let them out. Our 3year old would get up for a while and come do her business in the living room a we gated that off at night so she only has acess to tile floor and that stopped her real quick since she doesn’t like the cold floor. Ours do that, too! Also, If my husband gets up to take them outside, they jump back in bed. This is true during the day, too. One day, they were in the kitchen (where we keep their water bowl and water) with my husband and, rather than ask him for water, found me on a ladder in the closet on the other side of the house to let me know they were thirsty. I think the trick is kind of a “cry it out” method. They know if they fuss enough you will get up at cater to their every whim! I would recommend feeding them at a time you pick in the morning and not giving in. They will fuss a lot at the beginning, and have an “extinction burst” where they will probably have the biggest temper tantrum you can imagine (and do not give in at this point, otherwise they will have only decided they have to have a temper tantrum to get fed) but if you stay strong they will realize that all the fussing in the world will not get them fed. And then eventually you will get to sleep longer. They have trained you! You need to get back to training them 🙂 Just realize that every time you reinforce a behavior, you are saying it’s okay – that goes with feeding them when they fuss, petting them when they jump, etc etc. Stay strong, you can do it! I don’t know. I really need my sleep. I have “tried” making them wait but I end up being the one “crying it out” when I have to lay there, awake, for 4 hours while they fidget. Ha, ha. I mostly don’t doubt what you say (my dogs are crazy…I make them wait other times but it is not tolerable for me when I am trying to sleep….and their tenacity is unmatched) but I can’t seem to try “letting them cry it out” for more than a week then I cave due to sleep deprivation. Maybe someday when I don’t have a job or school I need to actually function at, I can wait them out for months. I wasn’t very clear……if I get up and feed them the moment they stir, the process takes 10 minutes and they will go back to bed until noon. If I don’t get up and feed them, they will keep me awake for hours. It’s torturous for me. We sleep with Silas, and I’ve noticed something. Silas also “can’t” sleep through the night reliably. He’ll want outside at 2, or at 3:30. But the thing is, when my husband is out of town, Silas doesn’t ask me to go out at all. It turns out that my *husband* is the one who can’t sleep through the night, and when he gets up to go to the bathroom Silas wakes up enough to want out, too. On the very rare occasion that Silas asks me to take him out at 2:30, I just don’t take him. This is the dog who will hold it for 14 hours because it’s raining; he can let me get a decent night of sleep. I keep the bedroom door closed so that he can’t get downstairs, and unless he’s really whining and pacing I ignore him. The other thing I’ll say is that I am *fierce* about guarding my sleeping space. When I feel like Silas is heading for one of the really uncomfortable places he tries to sleep, I move so that he can’t get there. He still wakes me up a few times a night wanting in and out from under the covers, but there is none of that “the dog is taking up the entire place my legs go” business anymore. That’s kind of a rambling answer–maybe you can extract something helpful from it. Oh, one last thing–magnesium supplementation is supposed to work wonders for bad sleeping, to the extent that it’s you and not the dogs. I know what you mean about them being able to hold it. Chester & Gretel can hold it for 10 hours in the crate. Unfortunately, in this case, they wake me up at 5 am to be fed, not go out to go pee (although I make them go out anyway). In the same vein though, they “wait” for their food until 7 or 8 am (way past their feeding time) sometimes when I get home late. They are bouncy ankle-biters until I feed them but they are not shaking, nervous wrecks when I walk in the door. However, when we are home, they become shaking, nervous wrecks starting at 4 am in anticipation of their food. BTW….the clocks got set ahead an hour last night and they STILL got me up at 5 am. How do they know?? Sheesh. I don’t know if this will work for you, but my solution is dog door. I figure if they really gotta go, then they can just take themselves out the door. All our dogs except Maggie have afforded themselves when nature calls. Maggie won’t use the dog door period. So if she’s gotta go, I’ve got to get up. I have a male, Beemer and female, Mitzi, who are siblings, and of course they sleep with us. They both have great bladder control, so asking to go out isn’t our issue, but their restlessness is! Start out under the covers, then outside the covers, holding the blankets down, so mommy can’t move or roll over. The under again, & snoring louder than dad. Then moving up between mom & dad, and hogging the pillows and bad Doxie breath in their faces. Yep, a good nights sleep is rare! I have similar issues with the dogs in bed and their waking up habits. My wife got into the habit of feeding them when they first woke up at 5:30 or 6. The kiss of death. Mostly they do pretty well and don’t wake us during the night, but they are early risers. Of course, we had to get a lot bigger bed to accommodate the 3 of them and the 2 of us. They are great little cuddles and each has their spot in bed. I don’t know what it would be like without them, for sure. Yes…kiss of death. Actually, I had Chester trained pretty well to “LAY DOWN” (stern voice) and wait until I felt like getting up to eat. Once I got Gretel though, that totally went out the window. They feed off each other and tag-team me until I get up. Oh man, do I hear you! My tricks are the exact opposite of some others. I pick up the water bowl and give them their final snack about 3 hours before bed. We go out for our last potty break RIGHT before bed. I’ve taught Kolchak a “settle” command to give him when he’s figety. Oh…and there was that whole time I slowly inched wake up time later and later one pain-staking minute at a time over a bunch of weeks. That was a pain, but it worked. Yeah, I think I should re-commit to working to push their “food in my belleh” time back incrementally. I think that is likely the best chance I have of getting some more sleep. That…or how do you feel about bully sticks in the bedstand? LOL, maybe they’d be content with a snack? I don’t have a problem with that necessarily but I don’t give them bully sticks often because of the calories. They are not the kind to leisurely nibble. Instead they will drill that thing down like a buzz saw within minutes. There is no way I could give them one every day. Plus, then I fear I would be treating them for their obnoxious morning gymnastics. If they’re getting up for food, I’d honestly just ignore it and feed at whatever time you’d like. If they’re acting really hungry, maybe a light snack before bed? Nola’s been sleeping in bed with me since I got her at 8 weeks. She has to go out around 6:30am to potty, but then has no problem coming back to bed for more sleep. The only time she wakes me up at night is if she’s sick. “Just ignore it” would be wonderful. Unfortunately, I have tried that for years and it just doesn’t work for me. Perhaps it is because I am a morning person so I am sleeping lighter by the time 5 am comes but if I “ignore it” I end up laying there totally awake for hours. Plus, their restlessness makes me restless which I fear disturbs my hubby’s sleep…and he is the one that actually needs to get up early to go to work. I should renew my effort to try Jodi’s technique to make them wait 10 minutes later in increments until they are reset to at least an hour later. I’ve tried feeding them a snack before bed but it makes absolutely no difference. It’s some kind of internal clock that goes off no matter how recently they just ate. We ended up putting Sparky’s doggie bed, with his favorite blankie, in our bedroom every night so that I could get some sleep. Prior to that he would come in and wake me up every couple of hours just to be sure I was there. We are just lucky I guess that 98% of the time he sleeps thru the night. But I do get chewable calming pills from petsmart or walmart for when he seems anxious. Good luck. I hope you get some sleep and get better. Torrey sleeps on the floor, or her bed, or the couch. Roxy starts out in her bed on the floor next to me. She wakes up at 330 or 400 every morning. They would both go outside to pee, if I opened the door. Instead, I scoop up Roxy and bring her to bed with me. She curls up, and goes back to sleep. Then they want want breakfast around 630 or 700. Not too bad, but not the best. I would gladly take 630 or 7! Ha, ha. in reality, I am a morning person and if I get up at 8 or 9 am I feel like my day is already half over. However, since I don’t HAVE to get up at 5 am right now to go to work (and never liked them waking me up at 4 am), I would rather they wait until 6 am thankyouveerymuch. I’m not sure it would work, but we are ones of the ones that did a trial of K10+Calming Formula, and the stuff actually worked during a tornado-warning storm–the kind of loud storm that usually has Barkly pacing back and forth & drooling. Give Barkly 5 minutes of doing that then Vlad decides to join in. Vlad wasn’t like this about storms until we actually had a tornado go by in Jan 2013. Since Vlad’s beard takes half of the water-bowl away when he drinks, I opted to put it in their food, so they’d get a whole dose of it, about 4 hours before weathermen said the storms were due to start. I asked K10+ in Twitter if I could and they said food takes longer. You might want to talk to @ilovemyk10 in twitter and see if any of their formulas would fit your situation. We’ve decided we’ll be keeping the calming formula here in the house from now on though. Drugs from the vet just made our dogs squirrely instead of calm like this & it worked better than the pheromone spray or calming collars combined. I’ve seen their other products. I might have to look into it, although it would be more of a “training aid” rather that something I used long-term for them. I’m exhausted just reading about all of you sleep deprived pet lovers! We went through our (every two hours pee routine) at night for the first couple of months but Roxy has turned out to be a great little bed companion. She won’t even get up anymore if we use the restroom! Well no dog is perfect, she loves to sleep in the bed all right, sometimes trying to get us to go to bed at 7! She is still not potty trained yet, never pees on the floor but does the “other” sometimes! I am home all day and can’t crate her to properly train. At least I’m not tired all day when I have to change her pee pads and clean up her poop! Ha, ha. Well count yourself very lucky on the sleep thing. Since Chester and Gretel are always 10 lbs it is easy for me to push them around in bed. They do take up a surprising amount of space for their size though. Ha, ha. I feel your pain. Im very lucky now that with a few rare exceptions are current dogs sleep very well through the night, and yes all five share our bed. They do wake up early around 6 am when our cats come into to ask to at, sometimes Id love to sleep in on weekends but its not a huge issue. However, when our dog Zira was alive she drove me bonkers by barking and whining at 4 am when she wanted to eat. I tried ignoring her bringing a chew for her to have in her crate crating her in the kitchen letting her in the bed out of the bed etc Nothing worked and its one thing about her I do not miss. We did adopt her at age 9 and I suspect in her previous home she may have gotten used to getting up at 4 am and just could not readjust to our schedule. I am positive that when Chester is gone, Gretel will still get me up at 5 am….and she will teach the new dog to get up at 5 am…who will teach the next dog to get up at 5 am. I am resigning myself to the fact that this is just my life. ha, ha. Ammo sleeps in bed with us because he has hated the crate since day 1 (although we have made a lot of progress through training lately). For the first couple of years we made him sleep by himself in the living room, it did work but some nights we dealt with him “knocking” on our bedroom door with his paw and having to ignore it for a few hours. Then we finally decided, life’s short and we’re much happier with him in the bed with us anyway. He thankfully sleeps all through the night (only getting up if he’s truly sick to ring his bell to get outside), and I am so lucky that he won’t even budge from bed for breakfast until I’m ready to get up – doesn’t even matter what time it is or when he was fed last. But I noticed that him wanting to sleep in our bed isn’t just about being with his “pack”, it’s mostly about warmth. If we had been sitting on the couch right before bed (and we weren’t in bed already), he will stay sleeping in our warm spots on the couch even hours after we went to bed. Eventually he comes in the bedroom when he gets cold. So I was thinking – what if you tried a heating pad (a really good one) inside a crate with their door left open to start? training them to sleep in there instead of having their restlessness wake you up at night. That or you could put a pet bed up high (level with your own bed – maybe ontop of a crate) with a heating pad so maybe they’d sleep on that right next to you instead of your sleeping space. That might not help the 5am wake up calls (unless the heat maybe kept them sleeping in longer) – but perhaps your sleep gets interrupted at night because they get restless (uncomfortable, cold, a combination) and if they had their own space you might sleep better. Just a thought! Mom gets about four solid hours of sleep and then it is on and off. Us dogs never wake her up but the cats do. Bailie sleeps with Mom but she sleeps and is sad when Mom wakes her up in the morning. The cats get in and out of bed, sleep on top of Mom, purr in her ears, one meows at 4am wanting food. Cats are the problem here, not the dogs. Can’t imagine taking the dog out in the night. I think Bailie has had to go out about six times since we got her and five of those were in the first couple weeks. Two weeks ago she drank like a fish late and night, so that was a no brainer with the 1am bathroom thing but at least she goes outside! Mom wouldn’t give up sleeping with any of us no matter how lousy she sleeps. Oh my, I do feel for you! I treasure my sleep and resent anything (even myself) that intrudes. Have you thought about using an automatic feeder and setting it for 5 a.m. and 5 p.m.? My dogs sleep in the kitchen with the gate arrangement that I use during the day, but I have 3 cats that pile on me, play with my hair, and the big male who insists on body slamming my face during the night! Hope you can get them into a better sleep pattern soon! I view all the discomfort a small price to pay for the love of a dachshund. I sold a dachshund puppy many years ago to an older gentleman who, as he turned to leave, started to cry as he told me that it had been 5 days since he had a dachshund in his bed (he had just lost his elder doxie) and was so excited to start his new journey with this young pup. Someday your bed will be empty…enjoy your nightly journey now. We don’t sleep with our dogs because we both feel it’s essential to get a good nights sleep and that just doesn’t happen with them in bed. Usually we let them snuggle with us for a bit, and then each dog has their own bed- one one each side of ours- and they settle down to sleep for the night. It can be hard adjusting them to a new routine/rules however, I do believe a few nights of not-great rest while they fuss/whine/adjust is better than doing it every night for…ever. I would use a product called DAP-dog appeasing pheremone, on their beds etc. It is calming-smells like a comforting nursing mother to the dogs- and will help them relax naturally. You can buy it at Petco/Petsmart and from amazon too. You are probably smarter than I. I can’t imagine not sleeping with them but, as I get older, a good nights rest is essential. I can’t say that they will never end up in their own beds. If they do, I will certainly try the DAP. I think someone else suggested that to me too and said it worked well. Perhaps I should try it for anxiety when we leave them in their crates for the day.